North Korea’s warming relations with its former arch-nemesis, the United States, and its reconciliation with its counterpart to the south are far from the only revolutionary change happening on the Korean Peninsula. Despite a somewhat charged relationship in recent years, North Korean leader Kim Jong Un went to China for a third time in as many months to meet with Chinese President Xi Jinping in Beijing, Wednesday. Meanwhile, South Korean President Moon Jae In is in Russia where he will meet with President Vladimir Putin on Friday. John Ross, award-winning columnist and senior fellow at the Chongyang Institute at Renmin University of China, joined Radio Sputnik's Loud & Clear to discuss the economic and geopolitical motivations behind the spike in diplomatic contact between the neighboring states. In the leadup to the Putin-Moon meeting, the South Korean leader proposed a pipeline plan to run Russian gas through the Koreas and even to service Japan. Meanwhile, Kim's overarching emphasis on fixing his country's economy could be a win-win scenario for North Korea and China, which is in the process of revolutionizing trade in Asia with its Belt and Road initiative. ​"There is a very strong historic link between North Korea and China, which has got some fraught elements in it," Ross explained. Stuck between a rock and a hard place, Korea struggled for centuries against China and Japan for independence. Nonetheless, since the Korean War, when South Korea traded Japanese colonial rule for a US-approved government, Ross said, North Korea and China "both [had] communist parties." North Korea's official ideology is Juche (self-reliance), but "in all reality it is a communist party, and that certainly gives them a framework for discussion which goes beyond purely state-to-state relations" with China. "The big difference, of course, has been over economic policy," Ross told Loud & Clear hosts Brian Becker and John Kiriakou. "China had a very successful economic policy, and to be blunt, North Korea did not." Therefore, Ross says, Beijing would be pleased if North Korea aligned its economic policies with theirs, which has meant a socialism with Chinese characteristics since the death of Mao Zedong in 1976. 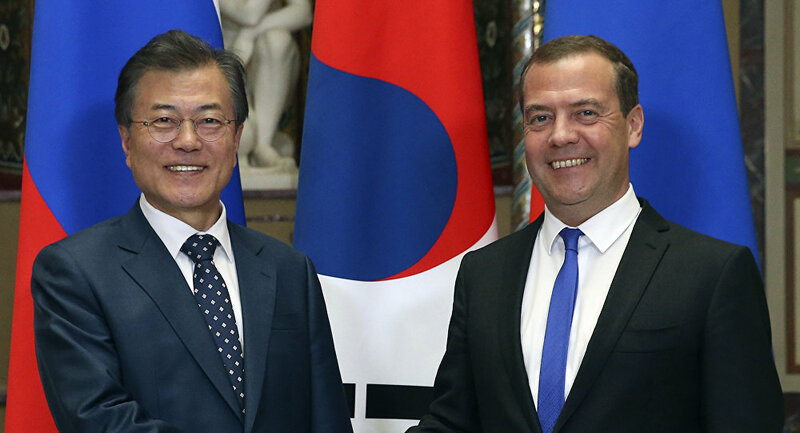 Moon met with Russian Prime Minister Dmitry Medvedev Thursday and will meet with Putin Friday. Meanwhile, Putin also invited Kim to Moscow, hot off the heels of the US-North Korea summit in Singapore June 12. Ross noted that Russia "has an interest" in the shifting landscape of diplomatic ties in the region. "While North Korea's main border is with China, nevertheless it has a border with Russia," Ross said. "And who, honestly, could trust the United States if… it took over North Korea, which is the perspective that some people in the United States put forward — you know, that basically there should be reunification, which is basically South Korea taking over North Korea." Ross elaborated on Russia's potential geopolitical interests, drawing historical parallels. "The United States moved its forces into Eastern Europe with NATO, despite the assurances that were given to Gorbachev that it wouldn't, and I can't believe that Russia would be enthusiastic, to put it very mildly, about having America going to North Korea, which means that they would have a border with Russia in the east as well." Ross said he envisions a South Korean realignment, albeit one with limits. "South Korea's not going to break from the United States," he said because, needed or not, the US provides them with security guarantees. "South Korea's economic interests are now much more significant with China than they are with the United States." Should North Korea turn towards a "more sensible" economic policy, opening up to foreign investments, then South Korea would also gain, Ross said.